Transforming perception of a business historically operating in the shadows. 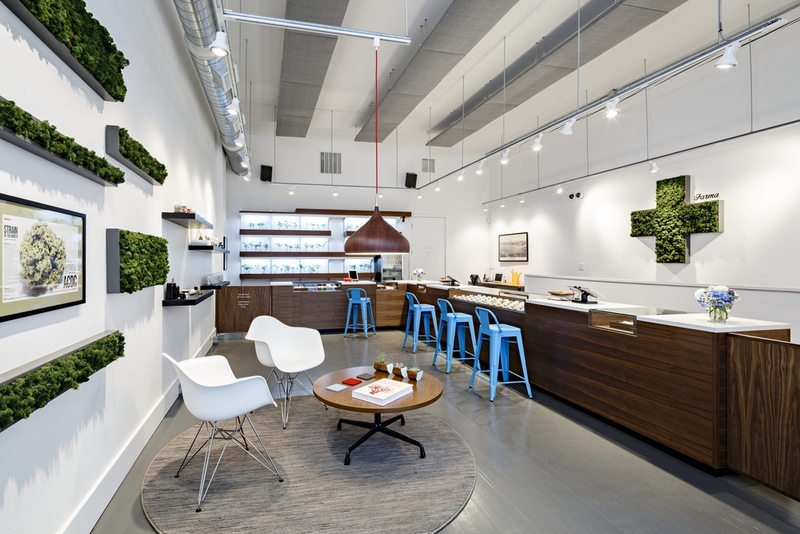 This project created chic and modern retail space for a high-end medical marijuana Dispensary in Portland Oregon. Working with the retailer, our intention was to transform the way people think about cannabis and create a contemporary image for a type of business that had historically operated in the shadows. Our goal was to bring this business "into the light", creating a space that is both welcoming and familiar: equal parts jewelry store, wine-tasting and tea ceremony. This project was an opportunity to consider and define anew every aspect of the medical patient's experience; from the website to the tactile nature of the custom fixtures as well as cabinetry and exterior signage. Using local artists and craftspeople we created warm and rich walnut cabinetry with inset glass-topped drawers and custom painted stools. We also designed an iconic image: a large green cross and wall hung boxes made of moss (hand-crafted by the architect). These moss fixtures perform multiple duties communicating both the concept of cannabis as medicine as well as providing acoustic dampening to reduce ambient noise. Farma is being well received by both the community and the media. A recent Willamette Week newspaper article proclaimed: "Farma is the cutting edge of marijuana as medicine. 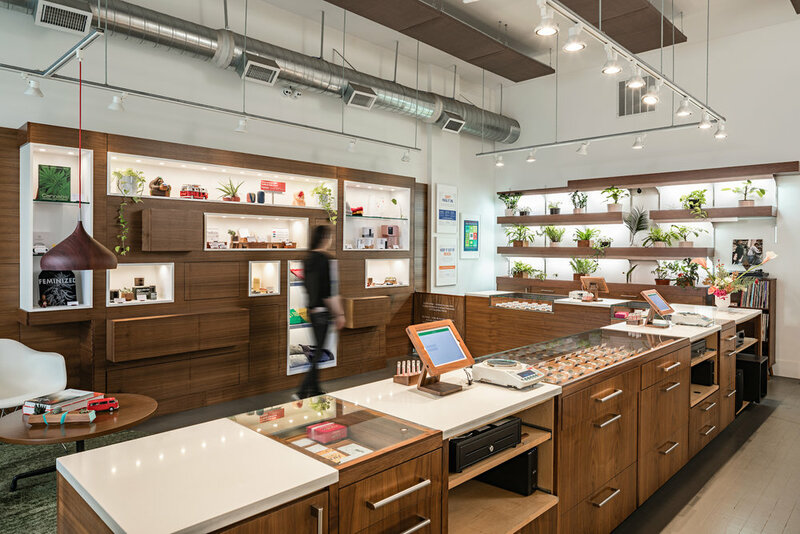 The shop pairs neatly appointed modern décor with a vast menu carefully curated to engage a variety of ailments and tastes ... Farma is one of the nation's gleaming visionaries for what medical marijuana could be". Elle Decor 2016: Portland Travel Guide "Farma is a clean-lined boutique, glossy and sleek enough to resemble an Apple store"
Leafly 2017: The 10 Most Beautiful Cannabis Dispensaries in America "An elite group of extraordinary storefronts across the nation serve as beacons of cutting-edge design, uncommonly elegant décor, and one-of-a-kind aesthetics." 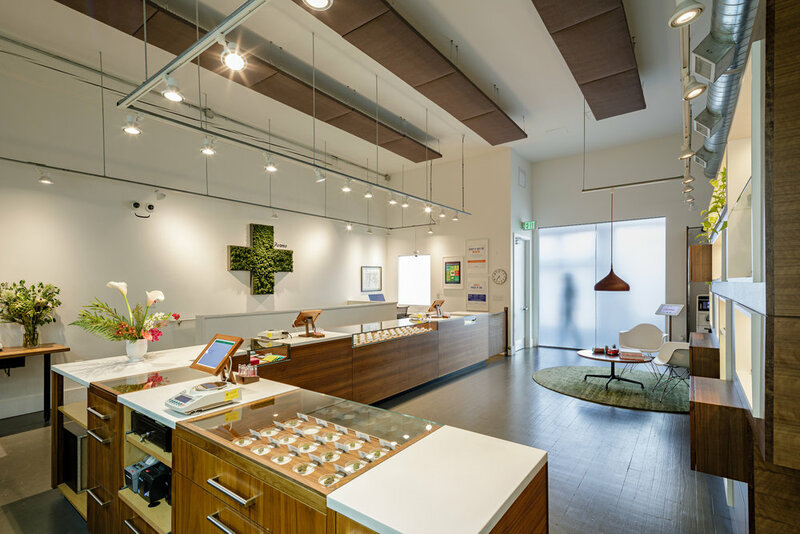 "While many recreational dispensaries purposely depart from the clinical feel of medicinal establishments, Farma embraces it and redefines the concept. Smooth surfaces, bright lighting, and white walls and accents all communicate that this is a clean, professional place to be. On the other hand, comforting touches – a circular rug, informal blue bar chairs, a single homey light fixture that departs from the rest of the bright track lighting – guarantee that patients will feel at ease. Even the classic green cross on the wall gets an update – it’s overflowing with real plants". Portland Monthly 2016: Is This The future ofWeed? 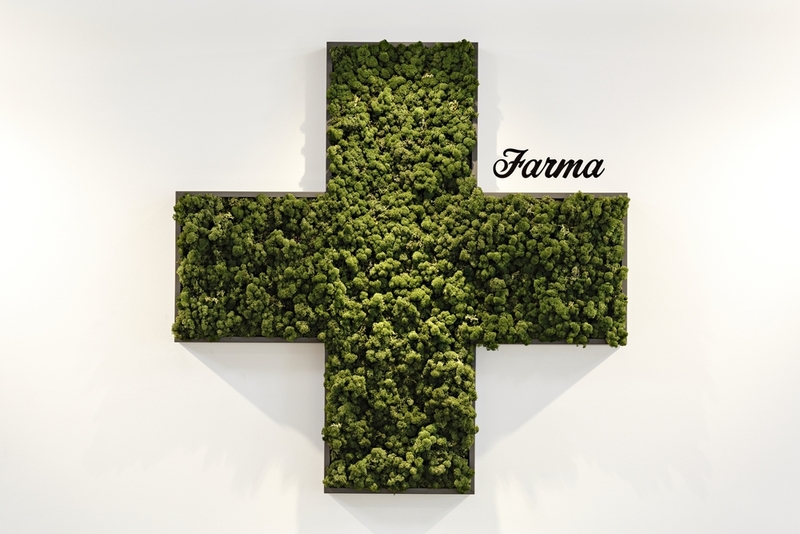 "Farma gleams like an upscale pharmacy"
Weedhorn 2016: Best Dispensary In America "Walking into Farma, the first magazine that comes to mind is Wallpaper, not DOPE, inasmuch as their aesthetic owes far more to Charles and Ray than Cheech & Chong". "Their shop isn't some paean to minimalism. It's about form following function, inasmuch as Farma's M.O. is therapeutic utility, plain and simple. Or, as they call it, "modern medicine."